I’d seen this mentioned in a few place, including our Hydrofoil post from Steph Bridge. So this was my number one focus throughout this first session – whatever I did all I cared about was the need to keep the foil in the water. Now, to start with I was raising up out of the water all the time but every time I was thinking – “Why did that happen?”, “What did I do to make it rise up?”, “What do I do to stop that happening next time?”. By asking myself that every time I quickly started to understand how my body weight affects the way the board rode, how my kite position affected my body position and how I could keep the board down in the water. And to be clear, just because you are aiming to keep the board’s foil in the water, you still get to experience the power, drive and efficiency of the foil. I weigh 105kg and was flying along in an average of 12 knots of wind on a 10m kite!!! So even though you’re not yet raised up out of the water, you can still start to feel the foil and use it to your advantage. This needs to be imprinted in your mind at every moment you are on the foil. If you bring your weight back over your back foot, it loads up the foil and causes it to rise. So if you are sticking to the suggestion of keeping the board on the water, then you must have your weight forward. And when I say forward I mean FORWARD. When I first tried to waterstart I instinctively did a normal waterstart, my weight balanced between my feet, and as I came up I pointed the board downwind by extending my front leg and allowing my weight to go over my back foot to control the power… BAM… the foil kicks up in the air, and threw me off! 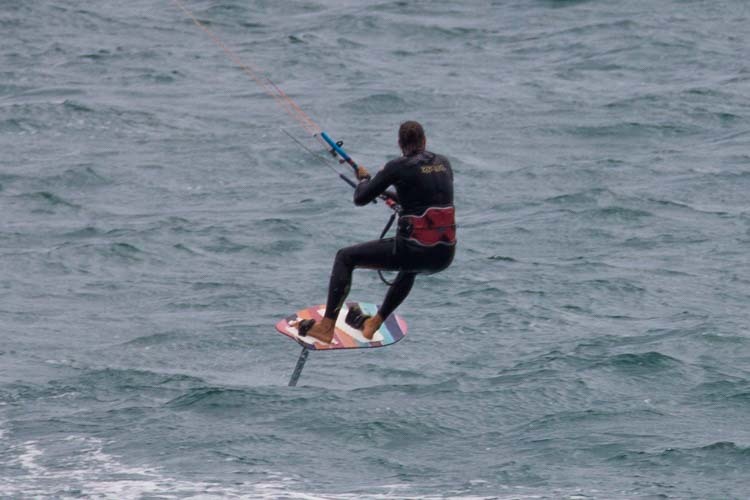 This happened a few times, until I realised I didn’t need to point the board downwind, the foil was generating enough lift and forward drive straight away so I simply pointed the board across the wind, got my body upright and just sat all my weight over my front leg – and I started cruising along. You’ll find that you can lean forward and have your full body weight centred over your front leg and the board will ride along happily. Then you can start making small weight changes to see how it affects the trim of the board. 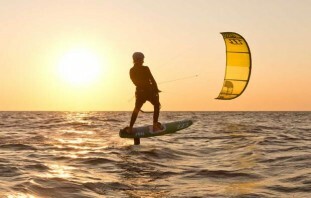 The combination of your board/foil, kite and wind strength will all play a part in understanding this new balancing technique. 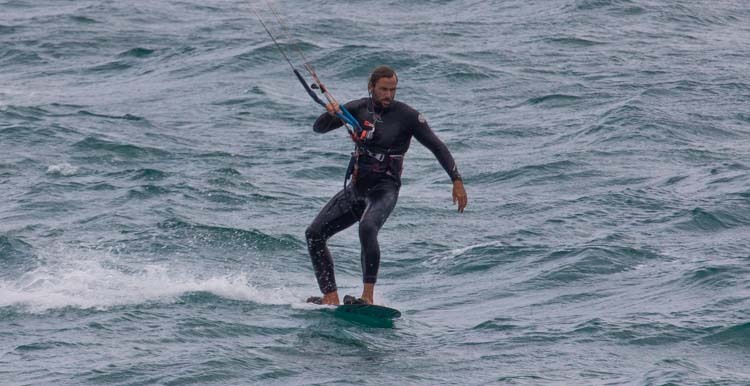 I know you want to jump straight on a foilboard – you’ve been kiting for years and think you’ll be able to overcome your body’s now inbuilt nature to sit back on your back leg and bury the tail edge. Unfortunately, it’s not that simple for most people and you could be starting your foiling experiences with a lot of unneeded frustration. Spending some time on a surfboard can give you the time to practice this new stance without the extreme crashes that come from attempting it on on a foil board. A surfboard is designed to have weight over the front foot, this is the way it wants to be ridden but mistakes offer a far less violent result. 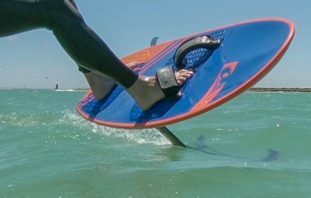 It’s even better if you practice strapless, slightly underpowered, this way you can’t accidentally revert back to back foot pressure without stalling or your front foot losing contact with the board. Go out on a surfboard and try riding with ALL your weight over your front foot. See where the kite needs to be to allow this to happen. Think about your body position and how your weight is sitting in your harness. I’ve been riding strapless surfboards exclusively for the last 4 years and I really think it made a huge different during that first foiling session. So even if you do this for a quick 20 minute blast before you take out the foil, you’ll get your mind and body focused on this weight distribution and hopefully it will carry over. So there you have it. Those three tips are what stood out for me – they may not work for everyone, my experience foiling is obviously very limited but I put them into practice the next day and they continued to help. When I accidently felt the foil lift I somehow got the balance right and truly felt where I’m heading as I glided along for 20 metres, balanced, listening to the gentle whistle of the foil cutting through the air… BAM… OK, still got to work on how to come back down! We’d love to hear about your first experiences foiling in the comments below along with any tips you might be able to offer or questions you may have about getting started. 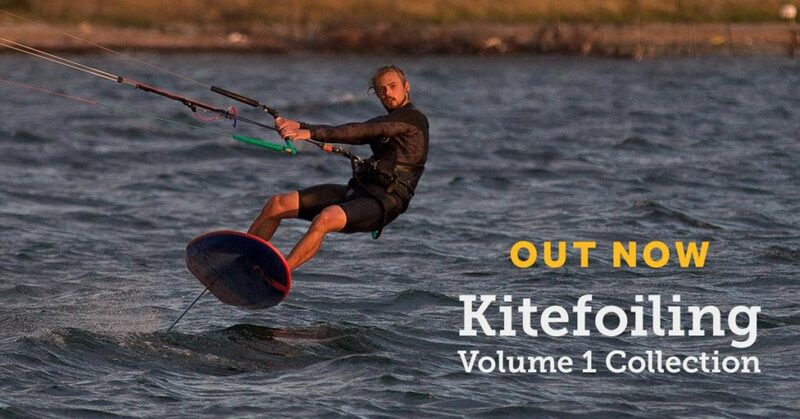 The Kitefoiling Volume 1 Collection is now available and has everything you need get up and riding on the foil. Its available to stream here on the Progression website or to download through the Progression app for iOS and Android. Finally, kitefoiling is open to any kiteboarder with basic kite skills and up for the challenge!